The Epic 2,200-Mile Tour De France Is Also A Test Of Epic Eating : The Salt Tour de France cyclists need to eat up to 9,000 calories a day to maintain their health and weight during the race. But many teams hire chefs to elevate the meals to gourmet status. The famously grueling cycling race involves about 2,200 miles of furious pedaling, huge mountain climbs and downhill sprints at 50-plus miles per hour. 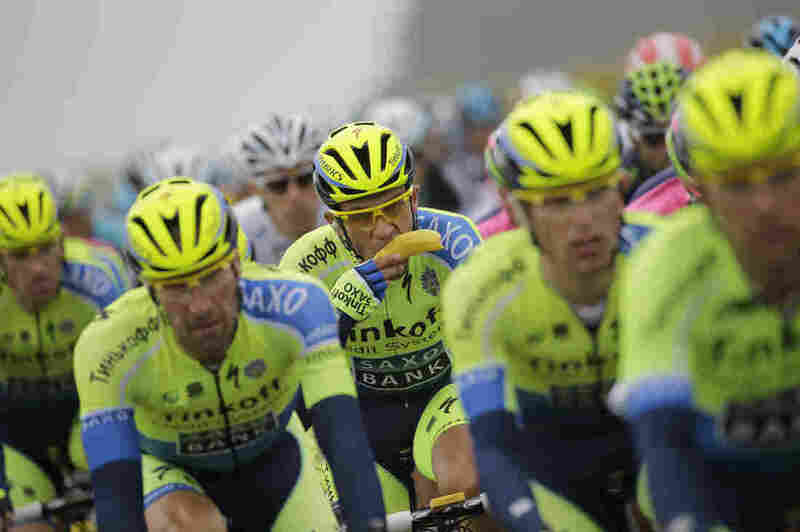 But the Tour de France, now in its final days, is also an epic marathon of eating. The cyclists now competing in the 101st rendition of the race are burning an average of 700 calories per hour while riding and, to keep their weight up and maintain their health through the three-week event, they must eat 6,000 to 9,000 calories every day. The almost nonstop eating begins with juice as soon as the athletes wake, according to Nigel Mitchell, head of nutrition for Team Sky. After joining their teammates in the hotel dining room, they devour a massive buffet-style breakfast, heavy on carbs and sugar, and moderate in fiber, which can add unwanted bulk to the cyclists' bellies. When they've finished this matinal meal, they pile into a bus, and keep eating, taking in hundreds more calories in energy drinks and bars before arriving at the starting line. Once they begin pedaling, team support vehicles shadow the riders, and assistants hand them energy gel packets, homemade rice cakes and Panini sandwiches. Still, some of the cyclists actually shed pounds during the Tour. Keeping up with the energy demands of the race is a balancing act. Mitchell says 350 calories is about as much energy as an athlete can absorb in one hour, and yet the cyclists are burning up to 1,000 calories an hour — as some of them surely did during Tuesday's arduous 148-mile ride through the Pyrenees. It's the first of three days in the mountain range and one of the hardest days in the whole race. "The body uses fat stores while the guys are riding," Mitchell says. By the end of the day's ride, the cyclists have built up a major calorie deficit. Back on the bus, they eat boiled potatoes, rice, canned tuna and capsules of fish oil as they're driven to the next hotel. When they arrive, they dig into a 2,000-calorie dinner, always heavy in meat, fish and other sources of protein — important for helping repair and rebuild the athletes' stressed muscles — followed by a fruit-based dessert. Before bed, the cyclists eat a bowl of cereal or yogurt. A few hours sleep is the only break they get from this demanding schedule of eating, Mitchell says. Calories should come from the right mix of sources: fat, protein, carbs and on good days, a little alcohol. "Traditionally, if you win a stage, you have a bottle of Champagne," Mitchell says. Sports physiologist Allen Lim has worked with Tour de France cyclists since 2005 and makes natural-ingredient sports drinks at his company Skratch Labs. He says a good chef knows each rider's tastes: what foods they like, what they hate and what they won't eat for health or ethical reasons. Sometimes, Lim says, the dietary choices of the riders prove too challenging — or annoying — for a team's chef. In 2008, when Lim was traveling with the Garmin team, all the cyclists decided they would ride the race on a gluten-free diet. The chef — a Frenchman — wasn't happy about this. "He was angry that the guys wouldn't eat pasta or bread," Lim recalls. The Garmin team now works with chef Sean Fowler, an American who lives in Spain. Fowler has been more willing to experiment with fusion recipes and some gluten-free items, Lim says. Fowler is tweeting his culinary wins on the Tour, like gluten-free toast with salmon caviar, baked salmon with avocado mousse, gluten-free coconut cake with sheep's milk yogurt and baked curry with marinated turkey skewers and prunes. While nutritionists like Mitchell accompany the teams to help direct meal prep and make sure all essential vitamins, minerals, fatty acids and other nutrients are served in adequate proportions, Lim says many teams have also hired chefs. "Unless the cyclists love what they're eating, unless they can celebrate dining with one another and enjoy what they're eating, then they just won't perform," Lim says. "If the food is bad, they won't ride well." Staying hydrated is important, too. Lim says there was once a prevailing element of machismo among some professional cyclists who abstained from drinking water as long as possible during a hard ride. Now, they've wised up, he says, and may drink well over two gallons of water and hydrating energy drinks per day. When nature calls during the race, they make a gentlemen's agreement to pull over all at once, drain their bladders and get back on the bikes when all are finished, Lim explains. But there is one thing just as important as eating, Lim says: showering. "When these guys are done each day, they're so freaking dirty," he says. "They have road dirt all over them. Before eating, they need to wash off." Showers, he says, are provided at each team's finish line station. "If they don't shower right away, it can make them very susceptible to getting sick."